Welcome to our Samsung D500 page. Below you will find a review and list of features, or you can just go straight to the best Samsung D500 deals. 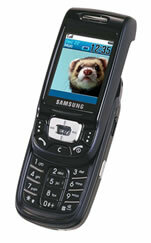 The Samsung D500 camera phone has certainly given the competition something to worry about. With its sleek and stylish slide design, the Samsung D500 can include one of the best colour screens on the market whilst remaining compact. Amongst the advanced features on the Samsung D500 are a video recorder, a 1.3 megapixel digital camera, MP3 player and bluetooth. However, you will still find that this mobile is easy to use and has fast and flawless operation - its menus are user-friendly, it has a large, bright colour screen and the speakerphone and ringtones can, if necessary, go really loud. The Samsung D500 throws down the gauntlet to its rivals, and sets new standards for mobile phones. Please see below for the full specification and the best deals on the Samsung D500. Battery: Standby time up to 220 hours, talk time up to 3 hours 20 mins. Video Clip Recording: Yes, 4x digital video zoom, phone can store 60 mins of video. Memory: 96 MB - Store 1,000 megapixel digital photos, 60 mins of video or 20 MP3 tracks.